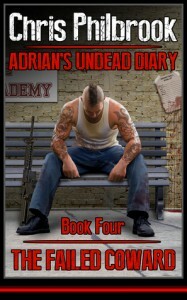 ABR's full The Failed Coward (Adrian’s Undead Diary Book 4) audiobook review and many others can be found at Audiobook Reviewer. This is a review of the fourth book in a series, please check out the first three before reading this. As it could contain spoilers for those books. For three books I have raved about how much I love this series. It is the depth to the characters, particularly Adrian, that makes it such a wonderful story. Typically I want zombie gore and more actions scenes than you can shake a stick at. This is not what you get from Philbrook in Adrian’s Undead Diary. What you get is a heart wrenching, tense and adrenaline pumping chronicle of how one band of survivors eek out their day to day lives that just happens to involve zombies wandering about. The Failed Coward seemed to suffer from what often happens in a series, you know the transitional book that has to written and read. Pretty much all character development. But if it were up to me, I might have skipped this fourth book and jump to the fifth. With the way the third book ended I expected a long drawn out defense of the school right of the bat. This was cut short with very little drama. Then right in to continuing to build their surplus of supplies. The best part, again it seemed to have been cut short and I hope it is revisited, was Adrian’s feeling of failure to protect the ones that he loved the most, when he found his military buddy. Adrian is clearly damaged goods and I await the moment where this takes center stage. Even though this book was not the best in the series, I will not let it sway me from continuing on with the rest of the books. I am all in a this point and I need to know how this series will wrap up as I am sure bad thing are to come for out lovable survivors. I cannot think of anything new to say about James Foster’s performance. He has been able to keep the exact same tone and feeling to every single audiobook so far. If your main enjoyment from audiobooks come from a solid, unwavering performance, than he is a great go to narrator to choose from.